Faust is the quintessential "somewhat happy ending story" that makes art great. Boito gave us Mephistophele, but it's the weaker opera despite the more cheerful conclusion. This Michigan Opera Theatre production proved visually and musically thrilling, despite some initial reservations about the leads. Directed by one Bernard Uzan, the high-stakes drama and passionate intensity shone through all night, while Steven Mercurio steered an especially tight orchestral ship. 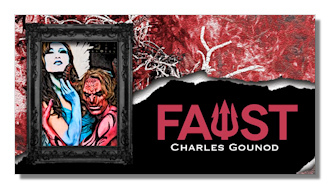 For me, both for Gounod and Boito alike, Faust is the least interesting character in these operas. I suppose that one has to consider how relevant a man like Faust would have been to his erstwhile audiences, but not he just seems naïve and even stupid. He doesn't even get to be especially funny, given that his suicidal ramblings, lovesick arias, and later damnation often so little in the way of wit. That doesn't mean you should play Faust as a bore, and in this sense Russell Thomas failed the test. His somewhat wooden, even disinterested Faust was neither relatable nor enjoyable, but that's partially the composer's fault. Vocally, Thomas proved a very capable artist who gathered strength as the performance progressed. His low notes were a hair shaky, and perhaps his projection left something to be desired as well. But overall, he earned his ovations. Mephistopheles (with pun intended) simply wicked fun. He's charming and even a little wacky at times, but clearly evil incarnate as the music rolls along. Director Bernard Uzon deserves credit for using lighting so effectively; some moments were truly chilling and the tension was built quite naturally. Matt Boehler dazzled; his mix of evilness and playfulness recalled Samuel Ramey, and there's not really higher praise than that. Technically assured, he lacked the older singer's heft but retained the snarl. This was an outstanding performance. Caitlin Lynch was also highly impressive as the woman with naïveté of Faustian proportions. Her scenes in the church and prison (Acts IV and V) were both terrifying and profoundly moving. Like Mephistopheles, her character effortlessly descended into madness, but with a sense of pure powerlessness that was tremendously compelling. Lynch's performance also gained in energy and conviction as the night went on, and the results were quite satisfactory. A few caveats. First, Act V (Walpurgis Night) seemed to be missing its opening half as far as the demonic bacchanalia. It's not essential per se, but it is quite a bit of fun. Also, some online reviewers took issue with Mephistopheles coming off of the cross in the church scenes of Act IV. Sure, it's not the most tasteful thing in the world – especially if you're a practicing Christian – but art isn't designed to be comfortable. The truth of the matter is that this scene gained an immediacy and sinister air because of it, even if Jesus coming off the cross so the Devil could get on seems a little strange. The supertitles were predictably bad, in that you couldn't tell who was singing what if there were more than two vocal parts. But supertitles are bad everywhere, and I assume loyal patrons are more than used to it by now. The chorus and orchestra were on top form. While perhaps not matching their colleagues at the Detroit Symphony Orchestra in terms of pure polish, they arguably played with a greater sense of character. Steven Mercurio balanced everything very nicely, and all the supporting roles were both very well acted and sung. An exceptional evening at the opera, even with a slightly dull title character.